The Elephant Parade was founded in 2007 by father and son Marc and Mike Spits. 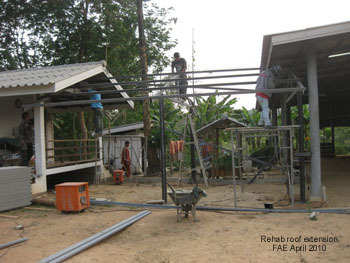 Friends of the Asian Elephant Hospital/FAE, founded by Soraida Salwala. 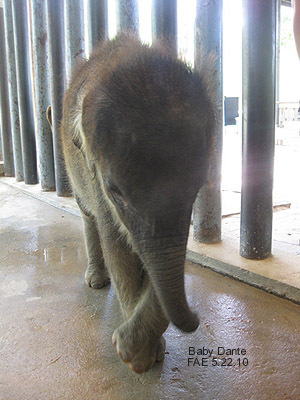 Here, Marc met a baby elephant named Mosha, that had lost her leg after stepping on a landmine. 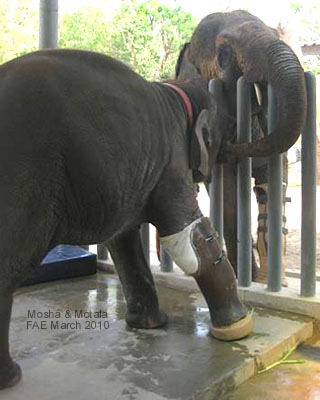 On June 9th 2008, baby elephant Mosha was the first baby elephant ever to receive a prosthetic leg, which was co-financed by the Elephant Parade. 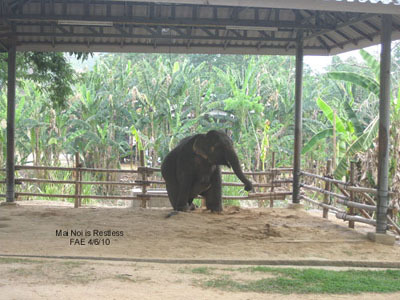 Excellent article with updates and information of Boonmee, Bobo, Dante, Mosha, Motala. 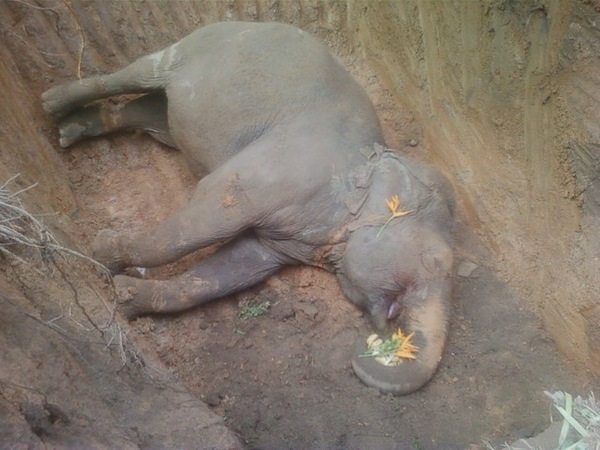 'Granny' Tanthong collapsed and died today. 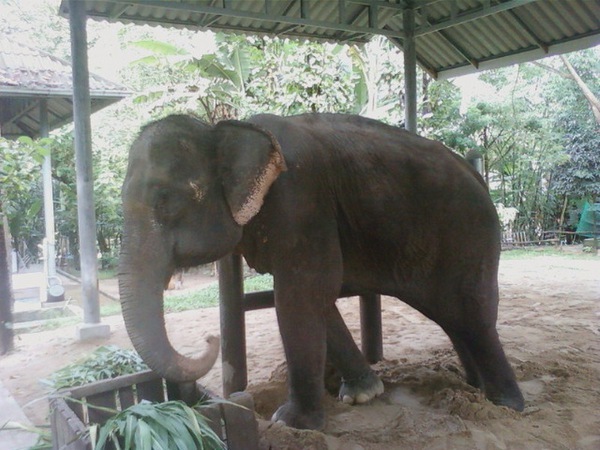 We'll bury Tanthong behind her infirmary, it was her last home and she'll be there forever. Mosha was told that Granny has gone into deep sleep and that she would be up there in the sky watching over her. Mosha made a loud cry as the last tribute to her dear Granny. until the last moment of her life! We all love you, Tanthong! 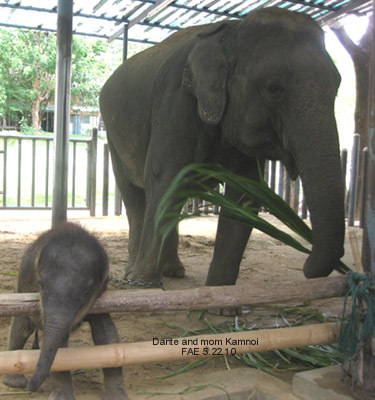 "Rest in Peace My Child"
for food & medicare for the elephants at FAE, Merci Beaucoup! from a tourist camp in Chiangmai. 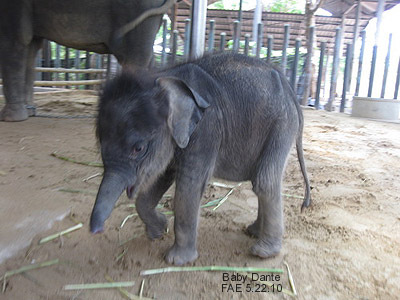 Bualoy is scared of injections just like many human beings. She receives 3 in the morning and another 3 in the evening. Sorry to be brief, no electricity here and we are having a difficult time. We are waiting for blood report. 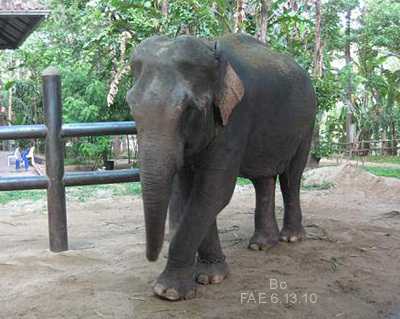 Bualoy has the same symptoms as Somsri, leaning her head on the post. Her hind legs cannot hold her body well. 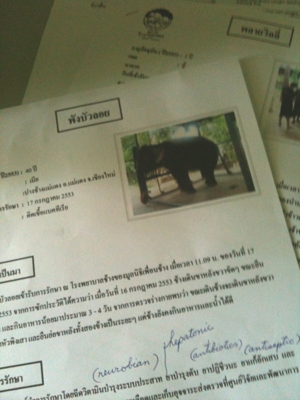 Dr.Kay has just given me a Thai report on her. 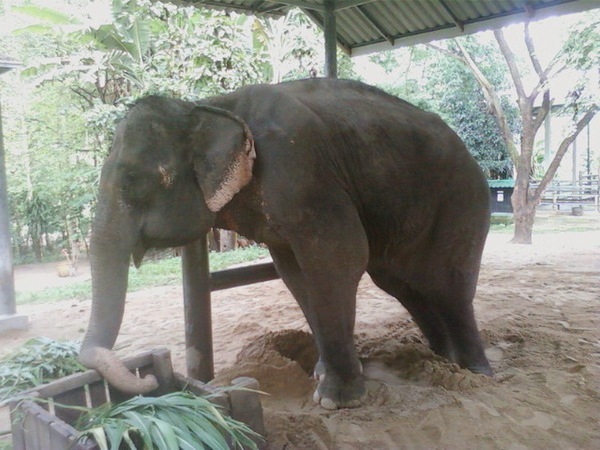 Bualoy, 40yr old elephant struggled until last minute of her life against crostidium. 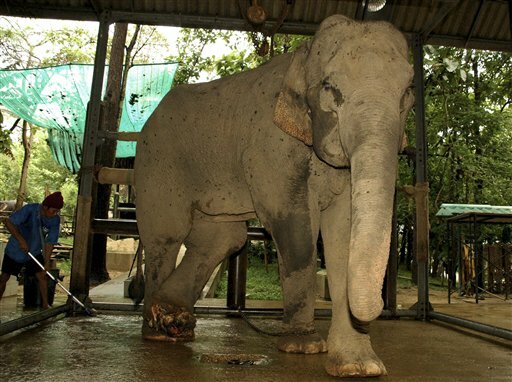 Motala usually wears her prosthetic leg twice a day, from 7.30 a.m. to almost noon and from mid afternoon till 5.00 p.m.
but at 10 a.m. this morning she did not put her weight on the prosthetic leg but lifted it up while she walked. 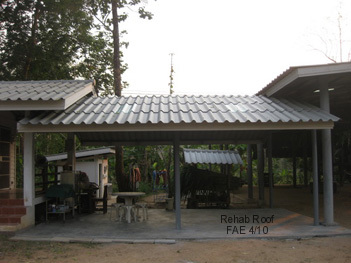 We have called the Prostheses Foundation and they will come here tomorrow. There is no wound no scratch, presumably the p. leg is loose. 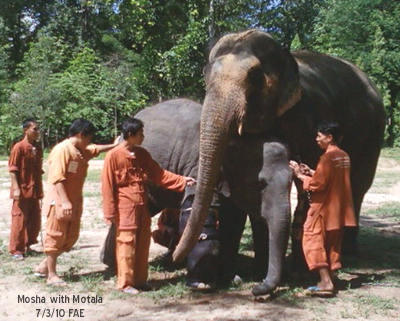 The five permanant residents, Motala, Mosha, Ekhe, Auan and Tanthong are in fairly good condition. 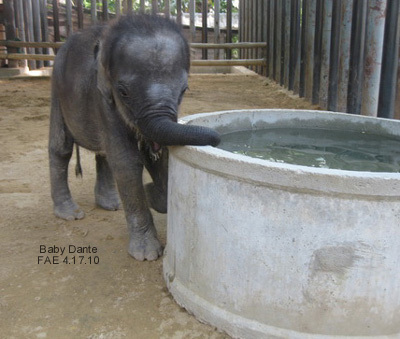 Dante, five months and a week old, still drinks goat milk (5 litres/day) and from his mother. has gained weight but her pregnancy is still being checked. 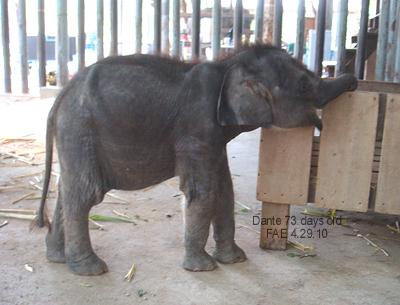 2 years old who arrived on the 17th July with diarrhea is closely watched. There are 14 patients in the hospital now and 2 are in critical condition, Willy and Bualoy. Even though I write mostly in Thai, the photos could tell the stories. Please accept my apologies for the inconveniences. 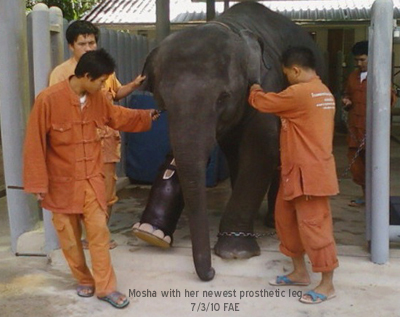 The Prostheses Foundation has made a new prosthetic leg for Mosha. 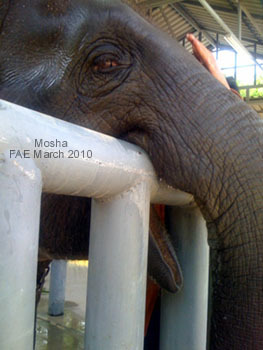 Mosha and Motala together. 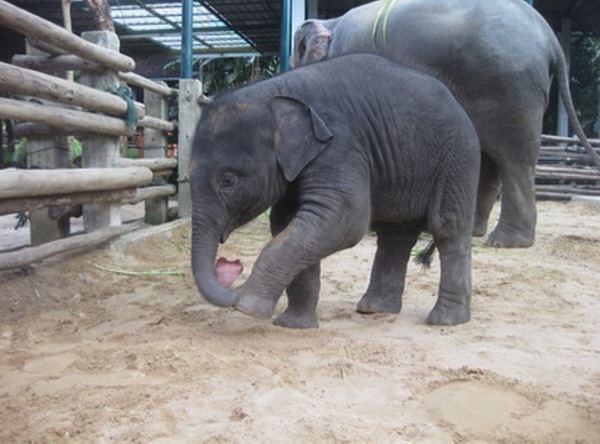 Little Mosha is fascinated with Motala's trunk. Trunk touching. We won the Best Short Documentary at the San Antonio Film Festival. 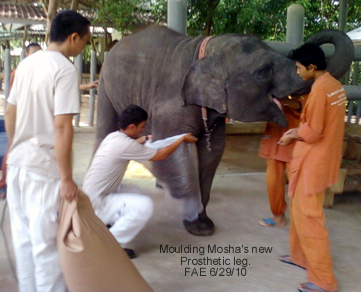 The Prosthetic team is in the process of moulding another one of Mosha's Prosthetic legs. 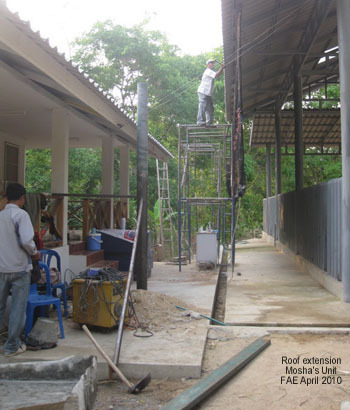 Mosha grows so fast, she keeps the team busy! 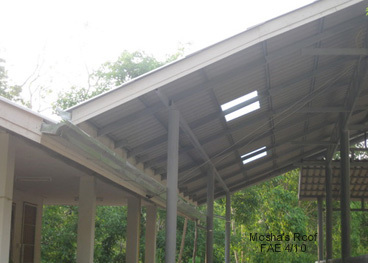 has donated 10,000 Euros for the food and medicare of FAE five permanent residents. 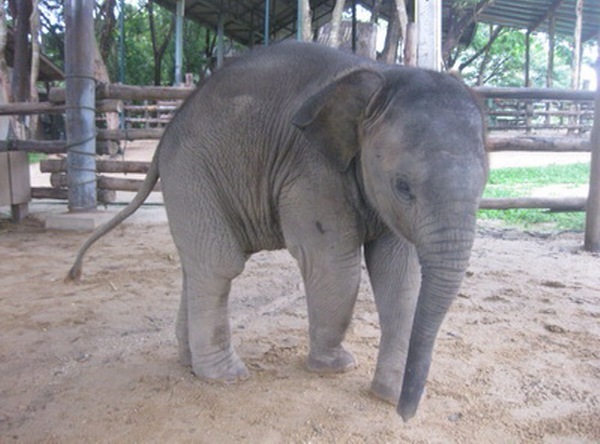 New Patient arrived last night: Bo or Somboonsub. Bo, 35 years old arrived at one o'clock. She is suffering from bloat. I.V started, several injections given, enema performed. By 5.30 she was relieved. Bo is 14-15 months pregnant and blind on the right. 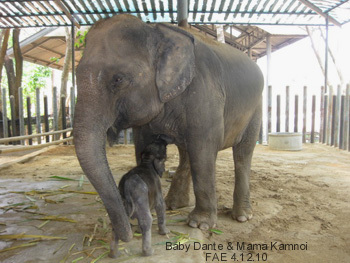 MaeNoi who came to be treated for bloat on the 11th December, 2009 has delivered a beautiful baby last night. 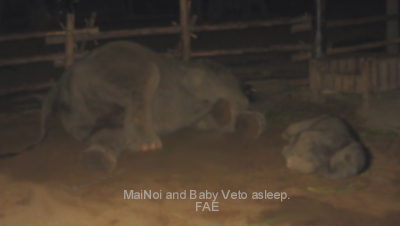 MaeNoi or Noi was in labour since almost two a.m. on the 8th June and delivered a strong baby boy at 11.25 p.m. 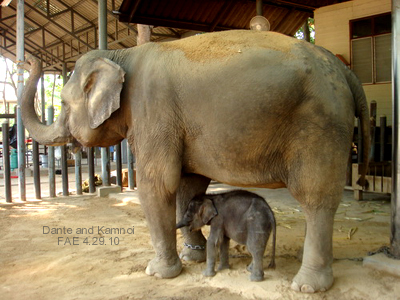 Both are strong and MaeNoi is so protective of her baby since the first minute. We are all very happy. The baby weighs approx. 80 kg. 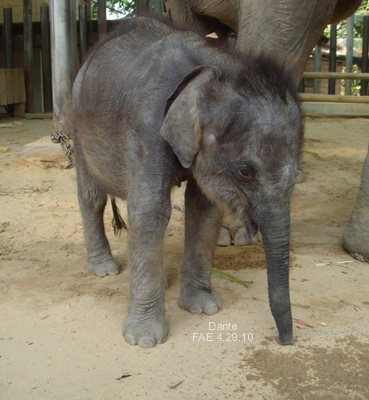 height 86 cm, chest 116 cm, body length 110 cm, trunk 31 cm, tail 45 cm. 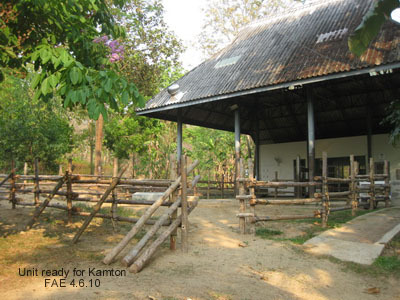 The owner of Nongluck called from Chiangmai today. 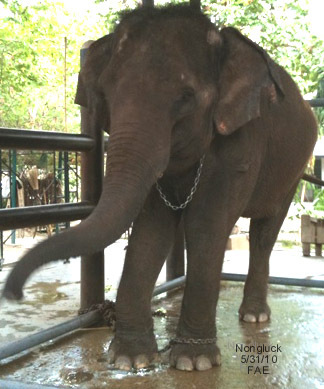 Nongluck had been restless, opening her mouth, sitting down and getting up. They managed to transport her here on the truck. 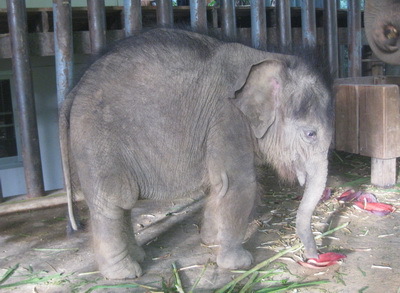 Her conditions are not good and she has not drunk nor eaten. 20 litres of I.V. administered, given five enemas but nothing has come out. Injections have been given too. Nongluck is now relieved from the bloat. She could sleep for an hour last night and now drinks and eats. Dr. Kay has just given another injections, antibiotics, vitamin and others. 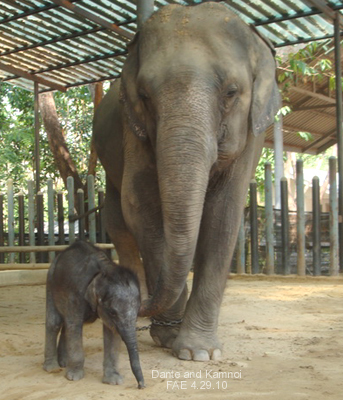 A short video of Motala and Mosha. 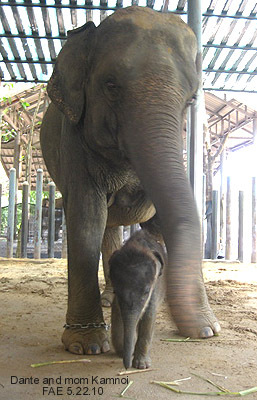 Mosha and Motala are kept from each other until Mosha is a little older and calmer. 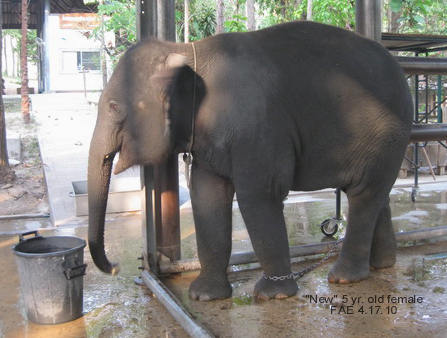 If she were let out, she would run and play and she might hurt herself and/or Motala. 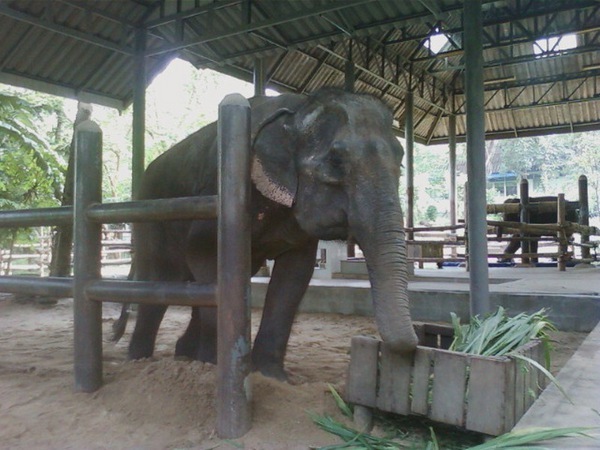 Meanwhile her shelter has enough space for her to walk and sand to play in. Please don't forget that both of these lovely ladies are getting used to their prosthetic legs and are not always stable. 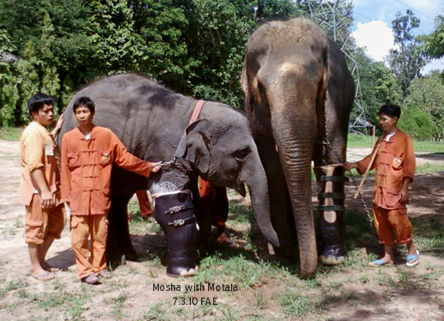 Mosha's prosthetic leg has been fixed, footpad was damaged. 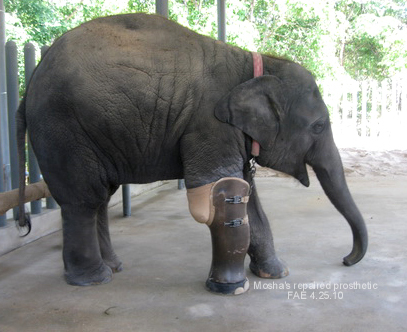 Now Mosha proudly walks on her new leg! "New" who suffered from unknown allergies and vomited, has fully recovered. She left early this afternoon. 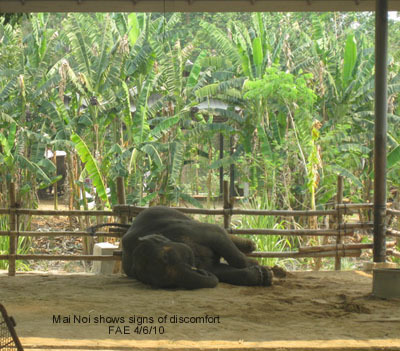 The three pregnant elephants are not in labour yet but Noi shows sign of discomfort and restlessness. 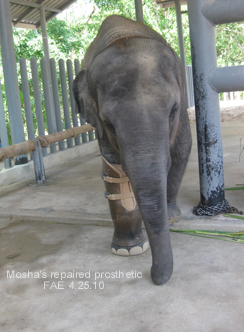 Mosha's prosthetic leg has been sent to be fixed, footpad is damaged. The other elephants are doing fine. 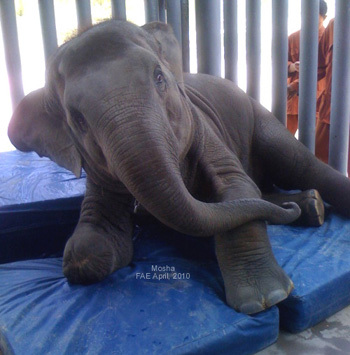 "New", a 5 year old female from a camp in Chiangmai, admitted to FAE with vomiting. 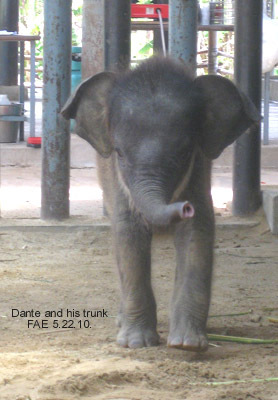 Dante is one cm taller and nine cm fuller in the chest. Body length is 7 cm longer compared to last month measurement. 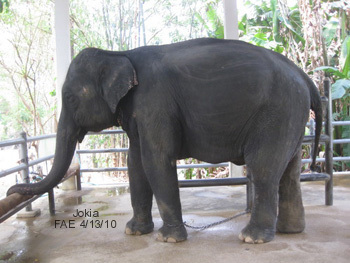 Jokia, one of FAE's three pregnant elephants has developed edema. 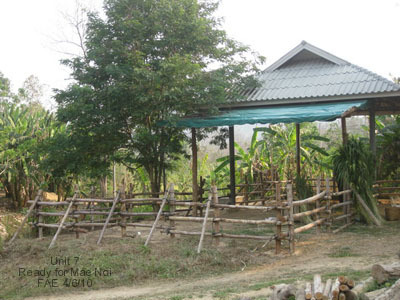 "We have fenced Infirmary Units #2, #7 and fixed #5 to be ready for the babies of MaeNoi (Noi), Kamton and Jokia." 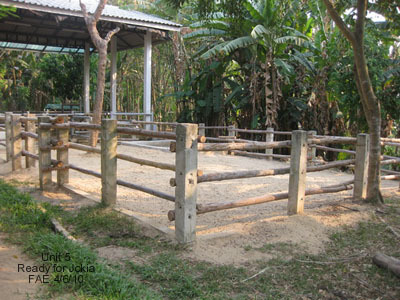 “Friends of the Asian Elephant” to you. JodysJungle.com website has been very helpful to FAE. Without the information provided on your website, it is difficult for FAE to reach out to more people. 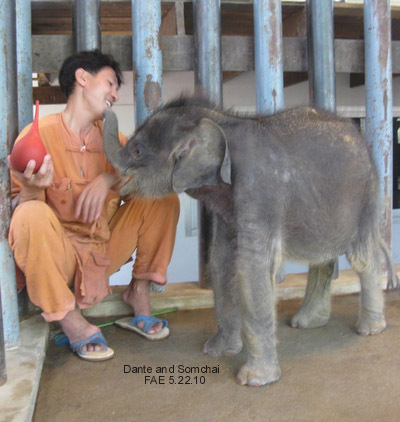 The elephants send their (jumbo) hugs"